Renaissance at Hatfield House – Construction and Installation Film credit John Bulmer. The secrets of this new sculpture will be revealed on installation in 2014. This approx 33 ft (10 m) water mobile is to be seen on the long approach to the front of the house. Illustrated here is the initial concept. 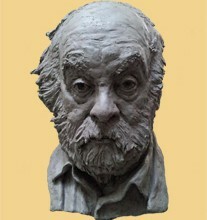 Angela has finished her life size portrait of the lovely playwright and friend Hugh Whitemore, in clay. 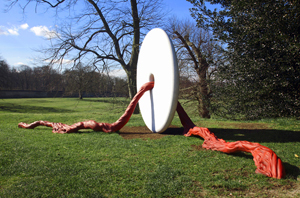 Angela’s new sculpture ‘Life Force’ for Boughton House, Northamptonshire was recently photographed by John Bulmer.